If you are able to help readers with their queries, please correspond with them direct. I am trying to trace the details of the parents of Nathaniel Frost born in Newport, 1790/91. I believe his parents were Joshua and Sarah Frost (nee Perrin) also of Newport. I have their marriage as being in Newport on 11.11. 1790 and Nathaniel’s baptism as 27.2.1791 again in Newport. What I would like to know is if he had any siblings and if so their names etc and also if I am correct in thinking Joshua and Sarah where his parents. I do hope someone can assist me. He was the only child born in Newport to Joshua and Sarah and that he was conceived well before the marriage. The absence of any burial records for any of the members of this Frost family indicates that they moved away from Newport. The next Frost born in Newport was John to Sarah Frost described as single in the house of correction on 26.10.1832. Since this is 40+ years after the birth of Nathaniel we can safely discount John as being a sibling though he may have been a distant relation. We can also be fairly certain that the subsequent Frost births listed in the Baptismal record are not relations, that family being connected to the Newport Free Grammar School who recruited ushers (undermasters) frequently from outside Newport. That family was recorded as being resident in Newport in the 1830 census made by the Rev. Monk and the only Frosts in Newport at that time. A further comment is that these Frosts were, in the 18’th C, at the lower end of the social status scale. With all the baptisms recorded in that century only and that the last recorded death was in 1810, the Frosts were a small group in Newport’s population which moved away. James Gapes b 1804 Wendens Ambo, Martha Barker b 1805 Wendens Ambo and 9 children b Newport or Wendens Ambo left in 1855 to Sydney. After 2 years they moved to Koroit/Tower Hill, Victoria. Job Porter b 1807 Wendens Ambo, Ann Cowell b 1804 Chishill and 8 children went to Australia in 1855 landing at Portland, VIC and ending up in Koroit. 4 Gapes children married 4 Porter children. Most of the residents in Koroit were Irish so it was no wonder that the 2 families had a lot to do with each other. Tower Hill is an extinct volcano crater and Koroit is the town nearby. Both are close to Warrnambool which was the main town for the area. There are lots of Porter and Gapes graves at Tower Hill. James Gapes b 1803 Newport and Charlotte Franklin b 1803 Widdington moved to London in 1825-27. 1st 2 children b Saffron Walden and next 2 Widdington, the rest in London, mainly Stepney and Mile Old End. 7 of these children went to NZ and settled in the Canterbury area. Their parents James and Charlotte were both dead by 1858 so it probably made the decision to emigrate easier. Generally families leaving from England were suffering from the agricultural and economic downturns and did much better in NZ and Australia going onto own property. It must have been very hard though. This is a transcription of the will of my eight times great grand uncle John Gapes. Not being familiar with Essex I have made a stab at the place names. The modern day equivalents would appear to be Aythorpe Roding, Keeres Green, Friars Grange and perhaps Cammas and Margaret Roding. I haven’t been able to find Hyfield. He must have been of some standing in the community with owning all these properties. He was married twice so not sure who had the marriage lands Thomasine Elsom (most likely) or Rebecka Stockes. The will can be viewed on the Essex Records Office site. Thomasine outlived John and her will names her Elsome relatives. Signed sealed published and declared in the pesons. My King's lived at Hazel End from around 1841 throughout the census returns. I know Mynotte King was born around 1802 and was a fruiterer and a master chimney sweeper. I have the address of Rose Cottage from the 1871 Census return. I was contacted by another descendant of one of Mynotte King's daughter's, Rose Ellen who told me that the King's were gypsies and that she had found memoirs of how Rose Ellen King felt leaving the site in Farnham and Bishops Stortford when she left to go to Chester with her new husband. She also has photos and other gypsy items.There is a family tale of them coming from Italy but she has no proof for this yet. I come from Rose Ellen's sister, Sarah who married Amos Freeman and settled in Jarvis Road, Bishops Stortford. My family knew nothing of a gypsy connection so I guess Sarah choose not to speak of it. I know they where a really nice family and despite one of their daughters becoming pregnant whilst being a scullery maid by an Earl, they never thought about throwing her out and not hiding this information so don't think she kept the knowledge of being a gypsy quiet out of any embarrassment. Many years ago I drove to Farnham but think I must have missed areas in Farnham as I couldn't find the church so will plan to go again. I was wondering if I would find any headstones or information of my King's? Mynotte King died in 1869 so wondering if I would find any headstones in the church? I was wondering if you had heard of any gypsies that lived in Farnham and if there is any information on them and I would like to find out what I can and put some 'meat' on them. The name is Eldred, and from what I can tell were living in Debden in the 1700's and perhaps older. From another researching My ggg grandfather Thomas Eldred married Jane Prior on the 12Oct1773 in Debden (I assume St Mary parish church). From Thomas Eldred born abt 1774; I have traced his father; Thomas Eldred. born 26 Feb 1748, Debden (married Jane Prior, b1750), his father Hugh Eldred born Oct 1712 Debden (married Mary Thurgood, b 1725, Debden), his father Robert Eldred born 1676 Debden (married Hannah Mead born 1680, Henham), and then his father also Robert Eldred who married Margarita Westwood (born 27th Dec 1642 Wimbish). They were married on the 22nd Nov 1671 in Debden and have seen the entry through the Essex (I think the seax website) online images of the parish books from St Mary the Virgin, Debden. However, I cannot see any earlier entry for Robert Eldred so cannot determine birth date/place. There is an entry for William Eldred born 1627 Debden, who I could guess might be his father but the trail ends there and all previous entries are in Latin. I presume Robert Eldred would have been born around ~1640 but have no record. If anyone knows or can help it would be much appreciated. Hopefully at least some what I have found might be helpful or of interest to any Eldred's currently living in Debden or surrounding areas. My two little grand daughters Maudie and Lottie have a most interesting double -strand link to Clavering. This is their story. In the 1850s many Clavering families migrated to Sydney. These included the Chipperfields from Hill Green farm and the Monks of Sheepcote Green (census 1841). Romance blossomed in the colony of New South Wales and Susan Chipperfield became Mrs Monk. Her granddaughter Judy Morrison married Barry Reading... Meanwhile back in Clavering James Bowtell (Bowkal) and his family were struggling after also working on the same farm (Hill Green) as Thomas Chipperfield - and moved to Great Chishill but within two decades all the Boutell/Bowtell children had moved to St Pancras, London. In 1966 one Chas Boutell, ignorant of his Essex heritage, travelled from London, overland through Europe and Asia to the Northern Territory in Australia. Tim Reading and Emma Boutell are the parents of Maudie and Lottie. I think they should call their Victorian home "Hill Green" or at least make a trip back to Clavering one day! I am trying to find old photographs of where my ancestors lived or worked. In my research my Great Grandfather a James Monk was the Victualler at The Green Man Inn in 1871, in your archives was there a Green Man Inn in the Arkesden Village or the close area, it gives the address as Church End? If you can throw any light on this subject i would be most grateful, I have looked on the web for this inn but have not found anything. Its possible that it no longer exists or is now under a new name. I have recently begun researching the BENNETT family of Saffron Walden. Some were bell ringers in Saffron Walden parish church in the early 1800s: Jonathan; George; James. I believe they were farmers/maltsters. I should be grateful for any information or advice. I am back about seven generations and suspect that the going may get tougher from hereon .The family don't appear to have strayed far from SW (why would they?!). One was the publican at the former Hercules pub in Newport. Another travelled as far as Dunmow! They appear to have lived generally in the Bridge End area of SW and occupied themselves as maltsters, and tanners as well as publicans: so not a very well off family though I am told that there is a link to Alfred Lord Tennyson but haven't found it yet. If any others are researching the Bennetts of SW I would be happy to share what I have. Just looked at the site on Little Sampford, very informative! My Gt Gt Gfather John PETTIT owned and ran the mill there. He and his wife had many kids, my great gfather Samuel eventually ending up in Goosnargh near Preston, Lancs, on his way from being a Scholar, placed at Kneller Hall which I think was some kind of academy. Strange but his church in Goosnargh was also St.Mary the Virgin. Would you have any interesting facts about the Pettit family(or any skeletons).Once again a good site! I am trying to trace my ancestors for my grandchildren, and my Great Grandfather was a John CHILDS born1834 in Thaxted, his wife's name was Mary, According to the census he moved to Chigwell, and earlier census have lost all trace of him. I was wondering if you could put me in touch with someone who can help me. I am investigating the history of Wall Wood in Great Hallingbury as part of a college project. Do have any information on the history of who has owned the wood and what it has been used for? As I wanted to draw a line in the sand during the 150th year after the arrival of my Farnham ancestors in Australia I wrote a 50 page historical “essay” on what I could find, or interpret from the records, that covered my Farnham MASKELL ancestors from 1751 to 1869. The first record in the Farnham Parish Registers for my ancestors was the birth of Joseph in 1751 (parents James and Elizabeth) and last the burial of John (a son of Abraham and Elizabeth and unmarried brother of my great-great-grandfather Isaac) in 1869. In fact the spelling of the surname is only Maskell in three entries in the Parish Registers. In the (about) 40 entries between 1751 and 1869 the spelling is more often Mascall but is also Maskall and in several entries Maskwell alias Maskall. Of the nine children of Joseph Maskell and Elizabeth Bearman (married at Farnham on 2 November 1775) only three remained in Farnham and all of their descendants other that John Maskell left Farnham before 1869. Armed with this information the 50 page essay followed the family from 1751 through the immigration of Isaac and family to Australia in 1857 to the move of four brothers to the Goulburn Valley district of Victoria in the 1870’s, where two selected lots in virgin bushland at Tatura and established farms (including my Farnham born great-grandfather Arthur Maskell) and finished in 1928 with the death of Arthur’s brother George (the last of the nine children that immigrated). Including biographical sketches of family members and genealogical files the volume was about 420 pages and 52 copies have been printed and distributed (50 to descendants plus one for the Tatura Museum and Historical Society and one to Freda Nancarrow). A cousin has also informed me that she has lodged her copy with the State Library of Victoria, which has established a Genealogical Centre and a collection of family histories of immigrants. The responses to the volume have been astoundingly good. As I wrote above, this does put a “line in the sand” and ended an at times frantic and concentrated period of research. However, for my own genealogical file and records I am continuing the research, but at a slower pace. I continue to look for answers. I am looking into the background of my Father. He was born Theodore Stanley PHILLIPS in the Red House, Coggeshall, in 1927. His mother was Irene Gladys Phillips, described on his birth certificate as a dairymaid of Blue Gates, Little Canfield. The electoral register shows that William Thomas Phillips and Martha Ann Phillips were at Blue Gates Lodge between 1925 and 1928, then at Beech Cottage in 1929. I think that he was a gamekeeper. An Alfred Gunn is at Blue Gates in 1929. I visited Coggeshall and Little Canfield from my home in Kent a month ago. (A contact in Coggeshall has kindly provided some background to Red House. Records at Essex Archives are either sparse or still closed.) I found Blue Gates to be a sort of farm shop on the south side of the road and a Lodge on the north side. The present tenants have been there but six months and although they directed me to 'an old lady who has lived here all her life' at a house further into the farmland from the lodge, I found it empty and boarded up. I would be grateful to know what information you might have about Blue Gates. Are there any records locally? I have been told that the land/lodge is now owned by a Trust. Also, was the family Phillips known and is it still extant? Just a little more background to the story..............up to 1910 ish, before going to Essex my Dad's natural Mother and her family lived near Highclere in Hampshire and her father was a gamekeeper on the Highclere Estate which belongs to the Herbert family, the Lords Carnarvon (the last one as the Queens Horseracing manager and the one before that, I think, was behind the finding of Tutenkhamuns tomb). They lived in a tied cottage and he appears in the Highclere records, according to their Archivist. The Phillips hailed from south Wales it seems but quite why the went to your neck of the woods after Hampshire, I don't know. I had imagined that my Father might have been the result of an 'upstairs/downstairs' type relationship between the aristocracy and a dairy maid, but it seems not! However, it is strange that my youngest Son and his bride chose Highclere Castle as their wedding venue in 2006..................none of us had ever been near the place before! My ancestors had farms and property in Anstey, Arkesden, Clavering, Elmdon, Langley and Wendens Ambo--all gleaned from wills in 1600 - 1750. I found baptism entries 1650 - 1666 for the children of George HAMOND in Wicken Bonhunt so I have a strong link with the area. Do you have any further information about the Hamond's and WELCH's? Later update: I now have lists of a few hundred Hamonds in NW Essex during period 1610- 1660 which I have gleaned from SEAX. Particular concentrations in Uttlesford were in - Debden, Henham, Stansted Mountfitchet, Wendens Ambo and Wicken Bonhunt with odd ones in other Parishes, and none in most. Also have found George Hamond's cousin, George Warren, was church clerk in Wendens Ambo 1646- 1653, his Nephew John Turner lived in Henham the son of Mathias/Matthew and Constance Turner. Can't find their marriage but Constance could be George Hamond's sister. The will of William Hamond, yeoman, of Berden- died 26 Jul 1734- bequeathed all property to John Hamond of Langley and George Hamond of Braughing to dispose of and equally distribute proceeds with their sisters - widows Sarah and Susannah Welch and Frances wife of John Woodley of Manuden. I'm trying to piece together family history and am intrigued to see if there is a link between my 3rd Great Grandfather, John SPENCER of Clavering Hall (born 1797 in Arkesden) and Samuel Spencer of Stansted Mountfichet and his son Charles Spencer of Birchanger. I'd be pleased to hear from anyone who has information that might be of help. I believe that my ancestor, William TALMAN, and his wife Hannah, were both buried at Arkesden Church and that there is a memorial stone in the churchyard. I visited Arkesden Church some years ago but couldn't find the headstone. William Talman was a renowned architect responsible for building several stately homes, including Chatsworth House, and worked with Wren on St Paul's Cathedral. I would therefore have expected to find some information about him on local history sites but can find no mention of him. I wondered if anyone has any knowledge of his connection with Arkesden and, if so, would be interested to hear from you. I would also be interested to know the position of his grave within the churchyard. Re: Searles of Newport My ancestors lived in Newport. My ggggrandfather's name was James SEARLE. In the 1841 census, he lived in Cage Green with his family (wife Ruth and children). He died accidentally in 1845. I think he may have been a coach driver, but I'm not sure about that. I have a copy of the death certificate, which states that he died on the 21st May, but I would like to find out some details about this death. Could you please direct me to someone / somewhere so that I can find out more about the accident? I would greatly appreciate any assistance you can give. I have been tracing my family tree and have come to a brickwall. My ancestor Samuel FRANCIS was born in Great Sampford in 1775 according to 1851 Census Records.Was married to a Frances Collins 27th Feb 1794 at Little Sampford the daughter of Thomas and Mary Collins. I have purchased all the microfiche for both Sampfords and Thaxted churches and have had the non conformist records check but have been unable to find any records of his parents. I have been informed that around this time there were problems between the residents and the clergy and many refused to have their children baptised. I was wondering if you could make any suggestions as to what available records might be available and how I can get hold of them. Many thanks for any help you can provide. I am looking for information on the history of Little Easton Lodge/Manor, specifically anything about the people who lived there. My 4x great-grandfather, James LACEY, was a steward at the manor under the Maynards. He was married to a Charlotte Cheffins whose nephew, Henry Cheffins was also a steward there. The connection came as quite a surprise. What information is there? Later update: Since my original posting I have found some information, and I took my parents to the open day this summer, and found the museum very interesting. There was no mention of James Lacey, but plenty of his wife's nephew Henry Cheffins. The family connection with Little Easton seems to have ended with Henry's children, as grandchildren seem to be in Australia. I am writing a selection of books called the War Torn Skies skies which covers each counties aviation history with an emphasis on the Second World War period. So far I have had two volumes published one on Hertfordshire and the other on Cambridgeshire and am now concentrating on compiling information and illustrations for the Essex volume with a fixed history span from 1908-1945. I would like to hear from anyone who has Essex aviation related memories, photographs or artefacts such as those taken from aircraft crash sites. These books are a totally different viewpoint and record in exact detail many observations and incidents that would otherwise be lost to history or become part of unconfirmed folklore. Of course they are in no way definitive publications but I am very interested in eye-witness accounts from persons who worked in the aviation industry, who witnessed aircrashes, enemy raids or has any memories that they would like to see published. The book is restricted to 128 pages but its amazing how much can be included into such a space. Although Essex airfields etc are covered in this work...details pertinent to these, such as units based their are also briely covered but can already be found in great depth in several other publications. What I am really interested in in for publication are stories, experiences, bits of that German bomber still in Uncle Fred's attic, aviation archaeologically excavated artefacts.....I will try to include as much material as possible...but since Essex is a large county with so much aviation history there will almost certainly be a Volume 2 for this county. I am trying to find out about an author who wrote a book on the POULTER family who I believed lived in Wicken Bonhunt or Clavering possibly in the 1970s. I wondered if you knew who it might be. I believe the author used to live in the same house as the Poulters who were a large family and had many sons going off to the 2nd w.w and they all came back. The house was called Blackbird Cottage and the author was there possible late 60s early 70s. When King Charles II and his brother James, Duke of York were returning from the races at Newmarket on March 26 1683 an attempt on their lives was to have been made outside The Rye House at Hoddesdon. I have accumulated sufficient material to start putting together a lecture to cover this subject. I have discovered references to "the fact" that his favourite mistress, Nell Gwynne is supposed to have had a house in Newport where he paused for a "comfort stop." Although it makes a good story I strongly suspect that it is not supported by any evidence. I wonder if anyone is able to shed any light on the subject? Any help you can give will be greatly appreciated. I am researching family history and would be grateful for your help in resolving a query concerning High Street Place in Saffron Walden. High Street Place was located off the East side of the High Street, approximately opposite The Friends Meeting House and adjacent to the old Frank Bailey's Garage. It appears in a photograph on page 81 of Rosanne Kirkpatrick's book, Saffron Walden ISBN1-84589-128-7. It is almost possible to discern the name High St Place, in the photograph high up on the wall of Bailey's Garage. According to Mr Stacey's notes on the 1851 census High Street Place existed at that time and my wife's birth certificate confirms that she was born in High Street Place in 1938. Yet on the First Edition of the Ordnance Survey map of 1878, Essex, Saffron Walden Sheet IX.5.4, it is named as Jones's Yard. Was this an error by OS? Might it have been a misplacement of the name Jones's Yard from further up the High Street, between what was once the Old Queen's Head Inn and No.74 High Street? Was there ever a Jones's Yard next to the Old Queen's Head Inn and does it still exist? Or was High Street Place simply renamed Jones's Yard between 1851 and 1878 and then renamed back again by 1938? Any help would be very much appreciated. I am hoping you can help me in my search for information about my maternal Grandmother. I have found from the 1891 Census, that my grandmother - Lucy ROBINSON, who was 4 mths old at the time, lived with her parents and family in one of the Wendens Ambo railway cottages. She migrated to Perth, Western Australia in 1911. Next year I will be travelling to UK to visit my daughter and am very keen to visit Wendens Ambo to see for myself , where my grandmother was born. Any additional information welcome. Having heard that Pigots still stood in Elmdon, we visited it to photograph the house where my great-grandfather lived. I've checked out a few census prior to 1911 and found reference to Pigots island in one. I have read the brief history of the village on the web site and wonder what happened to the Pigots manor house which disappeared as alluded to in the web history? It certainly looked a lovely little village and the few folk that I spoke to were kind and helpful. The house looks terrific, such a great setting surrounded by the moat and also the sign on a tree to prove it was the correct building. I'm sure Gt grandfather Jordan would be sad to see the somewhat overgrown garden, being a gardener by trade. He has a variety of Phlox named after him I was told. I came across the Strethall web site while searching for information relating to the descendants of the CRAWLEY family. I have traced my family back to the 1400s which originated from Nether Crawley and Crawley Green in the Luton area of Bedford and has two notable family lines one being, the Crawley's of Someries and then Stockwood in Bedfordshire and two, the Crawley's and Crawley-Boevey's of Faxley in Gloucestershire of which line I descend from. I am now trying to expand the family members that might have originated fromLuton and noticed the mention of a Thomas Crawley: Has anyone got any further information on the Crawley's living in this area? Any help would greatly be appreciated. My maternal grandmother was a CRISSALL originating around Saffron Walden and I am doing a little family research to annotate some old photos . All my work indicates that the surname of Crissall is limited to Suffolk , Cambridgeshire and Essex . The spelling has varied over the centuries. Bearing in mind the co-incidence of the name of Chrishall village ( for which there has also been varition of spelling ) and the geo-focus of my family name I wonder if anyone has ever researched that connection . I discovered by accident that Lofts Hall was the home of my ancestors the WILKES family. My great grandmother was a Wilkes and was next in line to inherit the estate after her cousin (who did). I only found this out recently by looking up Lofts Hall which was mentioned in a letter from a solicitor to my uncle many years ago. My father had mentioned that we inherited quite a large sum of money from the Wilkes family - and all boys born afterwards had Wilkes as their middle name. So I am interested to know if there are any photographs etc of Lofts Hall or anything written about it. I know it is a stud now. My great grandmother's uncle John Wilkes had no issue so left the estate either to a cousin on his wife's side or my great grandmother. I have searched on the internet. It is difficult finding things out as my father was 53 when I was born and the youngest of 7 so everything is a long time ago and he told me very little. I see the item on the Local History List on the new website, Recorders of Uttlesford History. The website is very impressive and must have been a lot of work. Many local history groups enquire with BALH about how to begin this kind of project which clearly builds on several years' work! I have passed on the details of the website to one such new community history group, as an example of what can be done and how to do it! If among the Uttlesford Local History Recorders there are individuals or societies who would be interested to hear more about BALH (including its insurance scheme for local groups), do please let me know a contact name/email and I will be happy to get in touch with them. <file://www.plymouth.gov.uk/museumstaubyncollection> . You may be interested to know that we plan to have a travelling exhibition at the end of the project and hope that it will reach Saffron Walden at some point during its tour. I hope that you can help me with my research and that I will hear from you soon. We will be including a short review in the August issue (on sale beginningJuly). As a former local I found the site fascinating! Well done. The site looks good. I am happy to recommend your site for anyone who wants to find out about Uttlesford's history. I run a similar site for the Dengie 100 in Eastern Essex called www.essex-family-history.co.uk and have a site that covers life in Victorian and Edwardian times at www.essex-country-life.co.uk. I did a demo for John Gordon the editor and leading light of Newport News to inform him of what is happening on the site and to see what can be achieved.He was impressed and enthused. I also had a very good reaction to the RUH site from a Canadian family of Newport origin for info on Newport and the surrounding area.I managed to answer the query and suggested she watches RUH and she liked it so much that she is passing it on to others in her family and friends. I have been searching for over 7 years for the birthplace of John Alderton definitely born in Essex and definitely born in 1806 or 1807 depending on which year he submitted his details for his Convict Indents either 1837 when he was sentenced or 1838 when he was transported to Australia. His parents were John Alderton and Elizabeth and he could possibly have had a brother Daniel born 1810 when John may have been baptised this is from information passed down in the family. I have searched many records in the last 7 years but to no avail. I have searched the following Parish records from 1805 to 1810: Langham, Great Tey, Adlam, Blackmore, Takeley, Earl's Colne, Barnston, Great Waltham and Little Waltham but nothing has turned up so this might eliminate some parishes for those with any records. I am about to pay for Colchester to be searched because John Alderton was in the British Army from about 1830 to 1837 before he was court marshalled and transported to Australia. I had the Kew Records search for his military records but because he was court marshalled and not pensioned off they were not kept. Congratulations on new website, loved the pictures. Have just had a look at www.recordinguttlesfordhistory.org.ukAnd wanted to complement you and the others on an excellent and useful site. Maynards in the early part of the 1800s. He was married to a Charlotte Cheffins (d 1820, bd Gt Amwell church) whose nephew, Henry Cheffins was a steward there for over 40 years. I know that Henry and some of his family are buried at the church next to the estate, but otherwise I have nothing else. I would welcome any stories relating to the above or life at that time, or pictures. Jo Kavanagh (Stansted resident, but East End born and bred). Saville/Savill). Isaac was baptised in Farnham (1 August 1811), as was hisfather Abraham (13 July 1783) and Abraham's father Joseph (21 October 1751, his parents being James and Elizabeth). The last entry for the family was the burial of Isaac's brother John on 3 April 1869. The spelling in the Parish Registers is "all over the place", being almost anything but Maskell - Mascel, Mascall, Maskwell and Maskall being examples. Every time the Vicar changes the spelling seems to change. For the sake ofcorrectness in my genealogical report (which will circulate fairly widely todescendants), I wonder if the churches prior to St Mary's (built 1858) were also named St Mary's (or St Mary the Virgin). Also, only three of the nine children of Joseph Maskell (1751) and Elizabeth Bearman, who married at Farnham on 2 November 1775, remained in the parish. I would like to contact any descendants of this family. Any assistance would be appreciated. Can anyone help with explaining what this poster is all about? 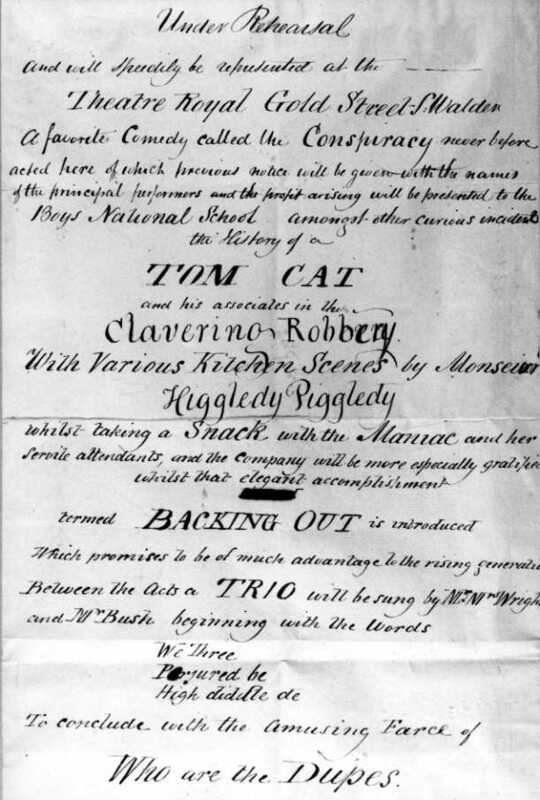 vbut what is the Clavering Robbery? vwhat was the 'Snack with the Maniac' reference? v'backing out' and the references to perjury suggest some agreed scheme had been abandoned, but what was it? vAnd 'Who are the Dupes? I have been researching the Bradbury family of Wicken Bohunt for some years now.Although there is much information on the web and also from the Visitation documents, much of that has many errors in it, once the primary sources are examined. I have examined a number of parish register but as I live in Western Australia so it is a time consuming exercise as I have to order and the wait for each microfilm of the parish registers to come. There is a particular problem which I am having at the moment in not being able to find the details of a Matthew Bradbury who probably married Jane Whitgift.I understand that there may be some connection with your parish of Clavering.I understand Jane was from Clavering and thought that they may have been married there.I believe the date of marriage would be about the mid 1590s. I am trying to trace my ancestors for my grandchildren,and my Great Grandfather was a John Childs born 1834 in Thaxted, his wife's name was Mary, According to the census he moved to Chigwell, and earlier census have lost all trace of him.I was wondering if you could put me in touch with someone who can help me. Some of my ancestors lived in Saffron Walden in the 19th century.My g-g-grandfather was John Hubbard KENT and according to the 1841 census he was living in the High Street with his father William KENT (50) coachmaker; mother Ann KENT (nee HUBBARD) (45); brother Richard (22) coachmaker; sister Mary (20); sister Sarah (15); sister Emma (14); John himself(7) and younger sister Martha (5).The KENTS came from Great Chesterford - William's father Benjamin was a blacksmith there (there is still a house there called "Kent's"). John Hubbard KENT became a "second master" (used to be known as "usher") at Gresham's School in Holt, Norfolk from 1851 to 1857.Interestingly he is listed as John Hubbert KENT.He married Eliza Susannah MARCON of Edgefield Rectory (a few miles from Holt) daughter of Rev William MARCON. John Hubbard KENT was by 1861 a railway clerk living at Wendens Ambo.He and Eliza had 2 children (my g-grandfather George Marcon KENT (1) and Nelson (4mths).It seems John had tried to establish his own school in Linton, Cambridgeshire in 1858 but it can't have been successful. (Springfield House in Horn Lane, Linton, is now a guest house). By 1871 John is described as Agent for Burton Brewers and by now living in Lancaster with his wife and 6 children.Sadly John died fairly young in 1877 at the age of 43.His 17-year old son Nelson drowned in 1878 in the River Lune.A double tragedy for the family - as there were 2 more children by then. I looked at Richard KENT the coachmaker, John's older brother. By 1881 he was 63, married to Susanna (59) and described as Coachbuilder (master). He seems to have married a bit later in life. Any further information on the Kents would be most welcome. I believe that my ancestor, William Talman, and his wife Hannah, were bothburied at Arkesden Church and that there is a memorial stone in the churchyard. Ivisited Arkesden Church some years ago but couldn't find the headstone. William Talman was a renowned architect responsible for building several stately homes, including Chatsworth House, and worked with Wren on St Paul’s Cathedral. I would therefore have expected to find some information about him on local history sites but can find no mention of him. I wondered if you have any knowledge of his connection with Arkesden and, if so, would be interested to hear from you. I would also be interested toknow the position of his grave within the churchyard. What a magnificent site and growing all the time! I have pointed several history societies and their members towards it recently and they have been extremely impressed. I have had a quick look at the new site and think it is going to be really helpful to those with an interest in the past and thedistrict covered.It is lovely to know that there are people who have undertaken such a mammoth task. I congratulate everyone involved. Thomas Waylett b 1792 Clavering married to Sarah Trigg 1771. They had two children George Waylettb1792 and Elizabeth Waylettb.1792.My line comes from. Elizabeth Waylett b1792.Shehad a daughter named Elizabeth Waylett (no father's name given) b1810 Clavering. She married Charles Negus (b 1809Arkesden) on 7th October 1830 in Arkesden Essex.They had 9 Children. The other Clavering connection mentioned is Elizabeth Negus b.1733 married Richard WomelsMay 26th 1756 in Clavering. Because of the close proximity of Arkesden to Clavering I expect therewere marriages between the villages. I have a founda few marriages and these are some of thenames. I don't knowyet where they married. My great great grandfather John Negus, married Martha List. Martha had a sister called Caroline List (Lish) who married George Law in Clavering on 19th October 1872). I am making enquires about family history of the following names: Moore. Welch and Shelford. My grandparents live on Mill Farm Gt Chesterford by the name of WELCH and MOORE, they were either millers or corn farmers in the 1900s. If they didn’t own them or rent them, they certainly lived there, also a Reuben Moore - he came from Thaxted. Any ideas please?